you can CHANGE the way you ACT! It’s not just a For Impact belief – there is compelling science around the psychology of change that includes tremendous work in the field of neurolinguistics. Pioneering researchers on cognitive science and linguistics have pointed to the paramount importance of something called FRAMING. George Lakoff, Professor at University of California Berkeley, defines frames as the mental structures that shape the way we see the world. He says that frames are part of our “cognitive unconscious;” but the way that we know our current frames or new frames springs from LANGUAGE. In the For Impact World we encourage you to CHANGE YOUR VOCABULARY. Like any new language, the fastest way to make progress is total immersion! Try as hard as you can to STOP talking about non profits, charity, survival, competing, donors, donations, etc. 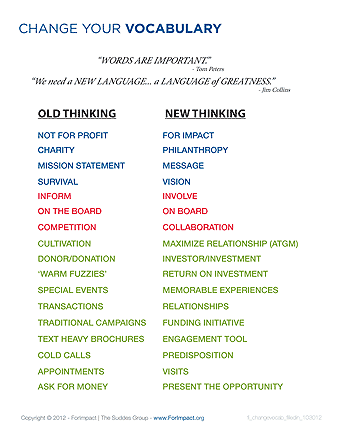 Use your new VOCABULARY with your Board and your team and it will become the lingua franca, which is a “hybrid language serving as a COMMON LANGUAGE between different people.” Use this new vocabulary to create a COMMON LANGUAGE for your entire team including staff, volunteers, and investors. This is to help you stop using Non Profit jargon and start using SALES TERMS. BUSINESS TERMS. COMMON SENSE TERMS. IMPACT TERMS.